Having been getting her hands dirty for 20 years, Abu Dhabi Pottery’s Homa Farley knows a thing or two about pots. Having been known to knock back up to seven cups of the stuff on a busy deadline day, Time Out Abu Dhabi’s David Clack knows a thing or two about coffee. Eager for a spangly new vessel for his favourite brew, our man cracked his knuckles, strapped on an apron and sat down for an hour-long lesson at Homa’s Khalidiyah workshop. Fancy crafting your very own ceramic masterpiece? Follow our step-by-step guide and you too could very soon have a coffee cup, vase or toothbrush holder to be proud of. ‘Before you begin,’ explains Homa, ‘You need to make your clay as round as possible.’ She slaps a lump of the stuff between her palms with wince-inducing force, before presenting us with something vaguely resembling a giant Malteser. We’re instructed to plunge our thumb into the top of our brown ball, being careful not to skewer it all the way through. Homa seems confident that in just a few minutes, we’ll have something resembling a pot. Recalling the time when we were scolded by our playschool teacher for eating our lump of Play-Doh, we’re not so sure. Next, Homa shows us how to hollow out our mug. We put our thumb inside the hole, our fingers on the outside surface and gently pinch the sides, rotating the clay and repeating until it starts to take a more concave shape. ‘The most important thing when making anything out of clay is to make sure everything is the same wetness and the same thickness,’ she explains, instructing us to carry out a second round of pinching, this time applying gentle pressure to large lumps to ensure the sides of our mug are of even thickness. Only this time, we have to close our eyes. ‘Blind people tend to do really well at pottery,’ Homa tells us, and, as we gingerly feel our way around our fleshed-out mug, it’s easy to see why. Next up, a little low-intensity sculpting. Homa hands us a ‘kidney’ – a thin, curved, rubber implement used to smooth over the dents our sausage-like digits have left in the clay’s surface. We’re also handed a brush and a tub of slip; a mixture of clay and water that looks a little like melted chocolate. ‘Clay starts to get dry as you handle it, so brushing a little slip on any dry and cracked bits stops it from cracking any further,’ say Homa, as we delicately touch up the rim of our by now rather handsome vessel. ‘i’ in Abu Dhabi, but with a swift bit of stick work we re-smooth the surface of our clay and have another crack at it. While she explains that there are several options when it comes to fashioning a handle, Homa shows us a method that will make it as structurally sound as possible. Which, given that we like a lot of tea, is just as well. Using plenty of water, we slowly pull down on a long sausage of clay, stretching the piece thinner and reinforcing the clay’s molecular structure. ‘It’s a lot like milking a cow,’ Homa tells us. ‘Or a camel.’ Next, we score hash marks into the ends of the handle, and also into the surface of the mug where we want to attach it, apply slip to both, and then carefully press the handle into place. Then, with a thin coil of clay, we reinforce the joint, smooth it over once more with our kidney, sit back and admire our handiwork. Homa hosts pottery building and throwing classes every Saturday, 4.30pm-6pm for children and adults, and 6pm-7.30pm for adults only, with the same classes on Sunday, plus an additional 10.30am-noon session. Each session is priced at Dhs150, or Dhs480 for four weeks of classes. 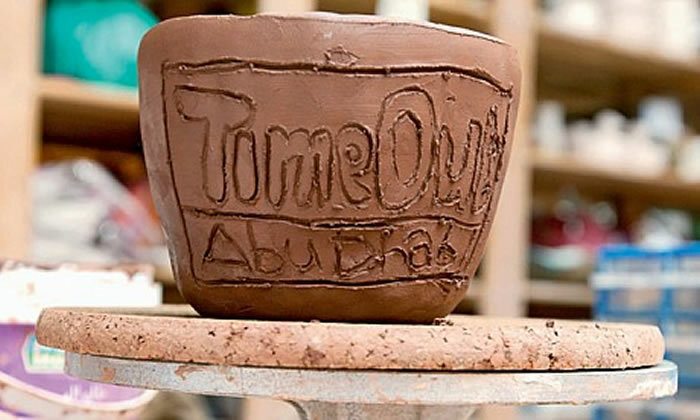 Abu Dhabi Pottery is located on 16th Street, opposite Khalidiyah Garden. Call 02 666 7079 for more information.